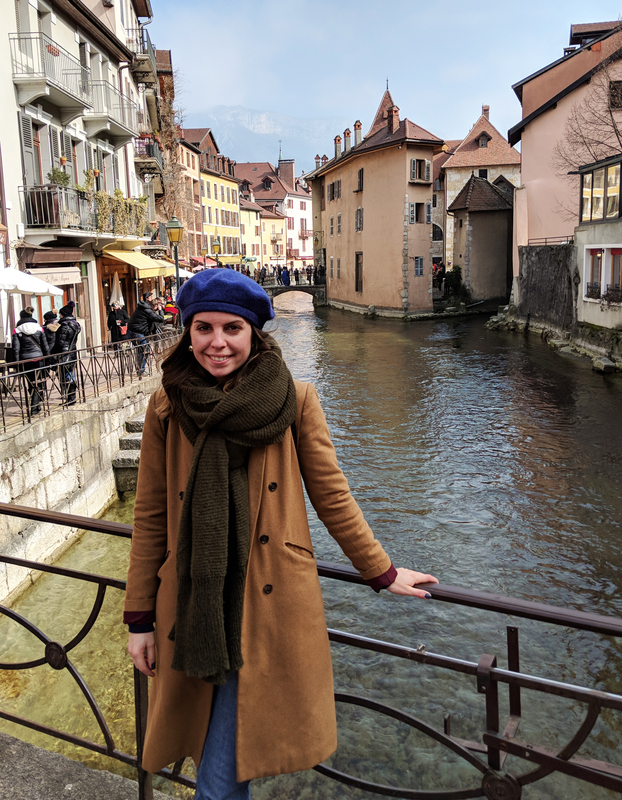 If you follow my on Instagram, you may have seen that my boyfriend and I, recently spent a long weekend in Geneva, Switzerland. Our trip was in partnership with Jet2.com – an inexpensive UK airline, offering flights, hotels and holiday packages to a range of destinations in Europe, plus Turkey and New York. What makes Jet2 stand out against its budget airline competitors, is that it offers allocated seating as standard and up to 22kg baggage allowance – a rarity with many other airlines. With my holiday allowance almost maxed out, we decided to take only a couple of days off work and enjoy a city break in Geneva. 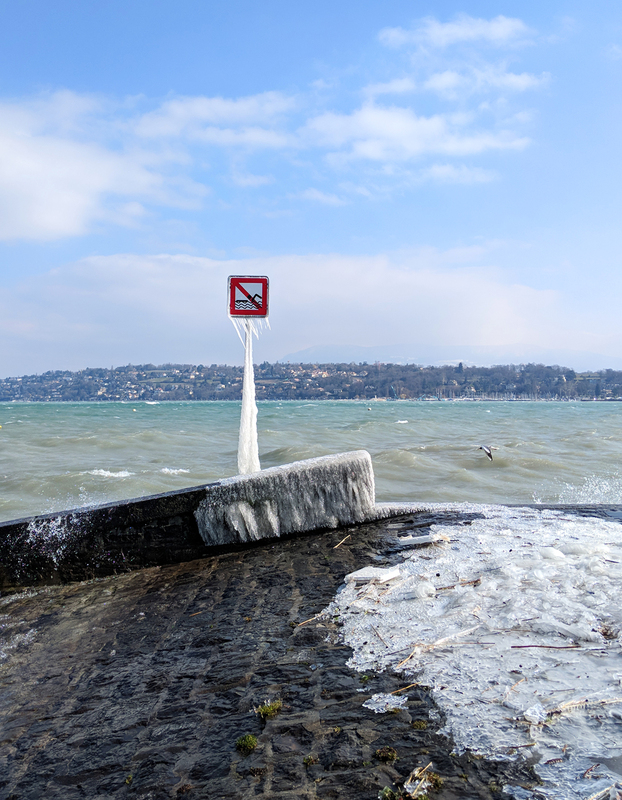 Neither of us had ever visited Switzerland before, and although most people only see Geneva from the airport (when flying in to go skiing and snowboarding in the surrounding French and Swiss mountains), Geneva is a beautiful city, with plenty to offer. Flying out from Stansted Airport on a Friday morning, it was just a 1.5 hour flight to Geneva. No sooner had we stepped through security, and collected our bags, we were whisked to our gorgeous hotel – NH Geneva City. Despite arriving a couple of hours before check-in, the lovely staff found a room available for us to check-in straight away. Our room featured a separate living area, with sofa bed, arm chair, TV and coffee making facilities. Connected via a doorway, was our twin room and bathroom. This large and spacious room, was made bright and airy by two huge windows, offering beautiful natural light in the morning, despite it being winter season and fairly overcast during our stay. After quickly freshening up, we decided to hop on the tram into the city centre. NH Geneva City is just a short 10 minute tram ride from the main train station, from which you can easily explore the city on foot. We were given a free travel card from reception during check-in, which allowed us to catch all trams and buses within Geneva for free, for the duration of our stay. I’m not sure if this is standard practice across all hotels in Geneva, but it’s a fantastic bonus, which we took full advantage of, considering the freezing temperatures at this time of year. Continuing the transport theme, Geneva is ideally located to explore other areas of Switzerland (including Lusanne on the opposite side of Lake Geneva), and is just a short journey from the French border, ideal for those looking for a snow holiday but also for those (like us) looking to explore a bit more of these two beautiful countries. 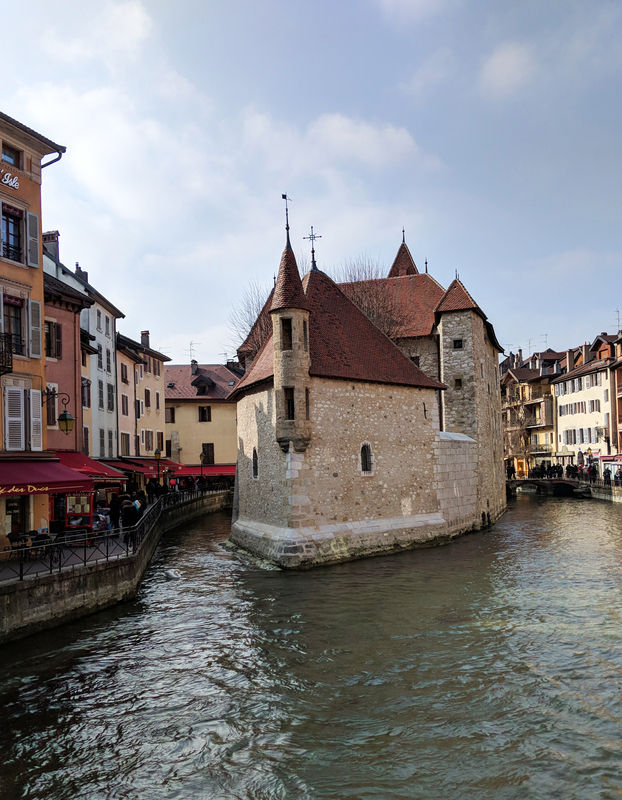 Aside from transport, Geneva is famous for its food – namely cheese and chocolate – and it’s watches, as well as being home to the United Nations. 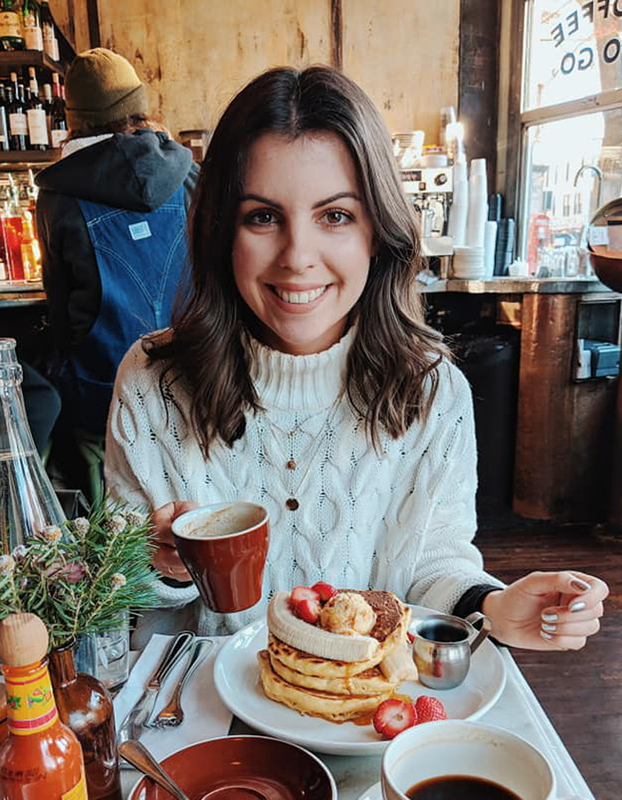 With that in mind I thought I’d share my top 5 things to do in Geneva, to hopefully inspire any of you who may be thinking of taking a trip to Switzerland, or have perhaps flown into Geneva but not taken the time to explore the city itself. It’s ALL about the Swiss cheese. We spent the majority of our trip eating cheese. 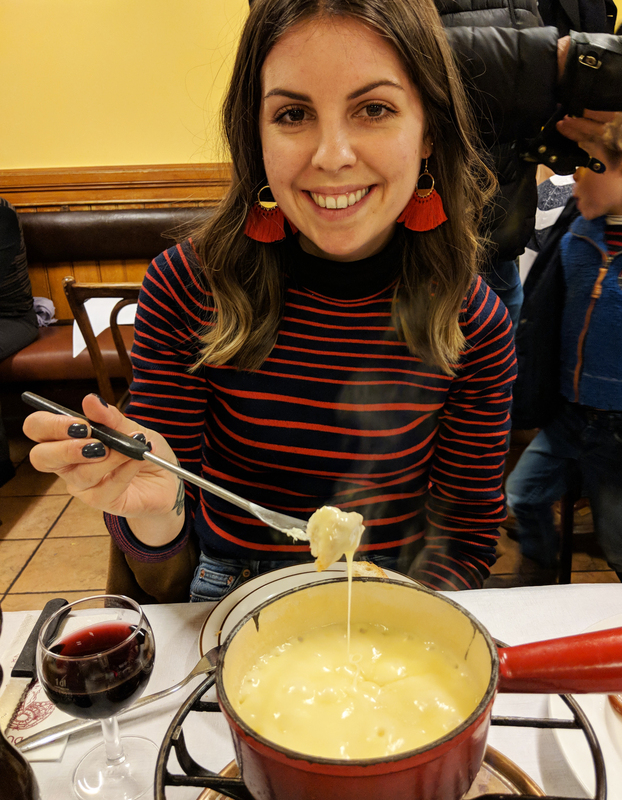 It was melted on top of potatoes (raclette), it was grated over pasta, it was sliced alongside meat, but the best way to eat cheese in Geneva, is by enjoying a fondue! Believe it or not, this was my first ever cheese fondue, and what I can say, it was incredible. 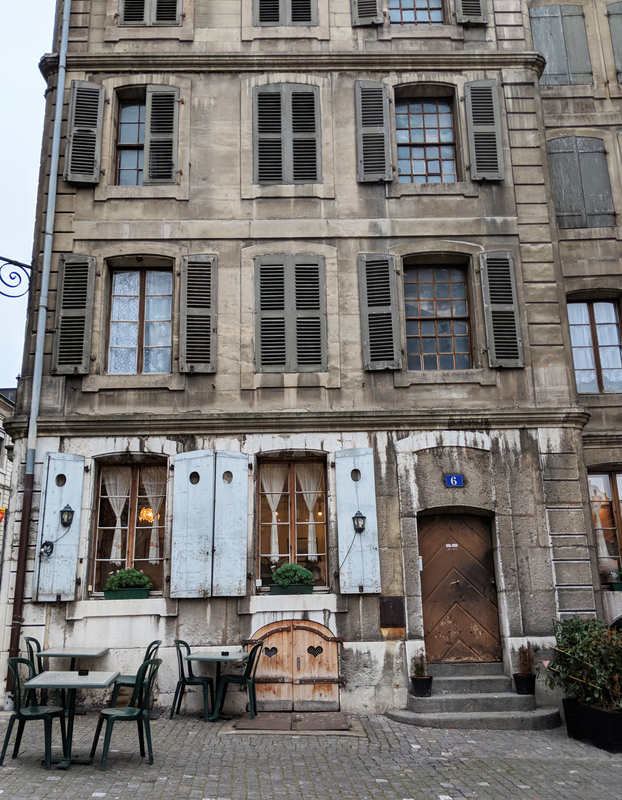 Upon searching for the best fondue in Geneva, we found Café du Soleil. Located a 15 minute walk from NH Geneva City hotel, this is one of the best spots in Geneva, and is super popular, so you must book ahead. We managed to get a table for our second night in the city, and it was the quaintest spot. Beautiful fairy lights, super helpful staff, and small but perfectly formed menu, you are bound to have a great night here! We enjoyed one pot of fondue with a selection of bread, meat and potatoes, a couple of glasses of red wine, and to finish – some of the best meringue I’ve ever had the pleasure of eating. This is my top recommendation! Our favourite part of the city was the Old Town, located on the other side of the water to our hotel, just a short walk up from the lake. The architecture here is beautiful. Soaring buildings, narrow cobbled streets and impressive views across the city. It’s well worth the hike up the many steps to the top of the town. Also in the Old Town is St Pierre Cathedral, a fantastic gothic church, perched right on top of the hill. 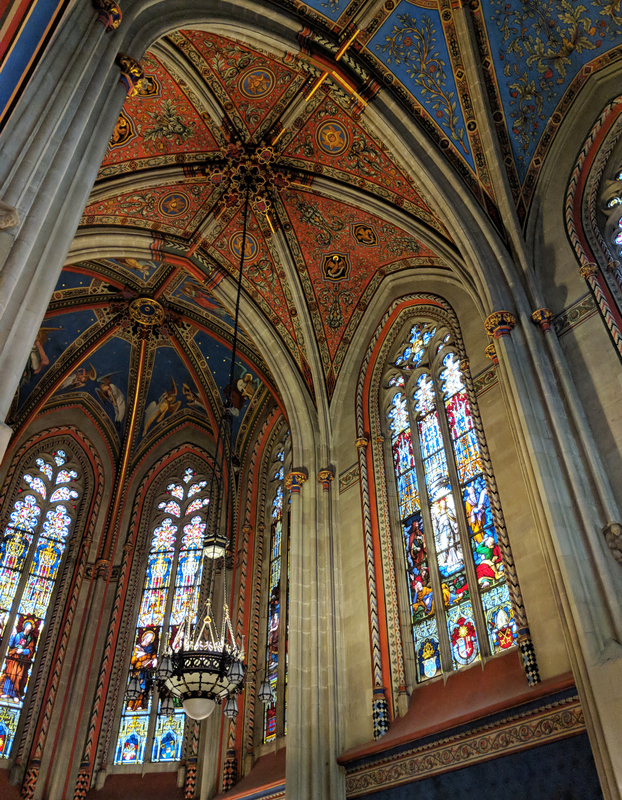 Dating back to the 12th Century, it’s free to explore inside and has an ornate patterned ceiling (pictured above), which is worth a peak inside for alone. 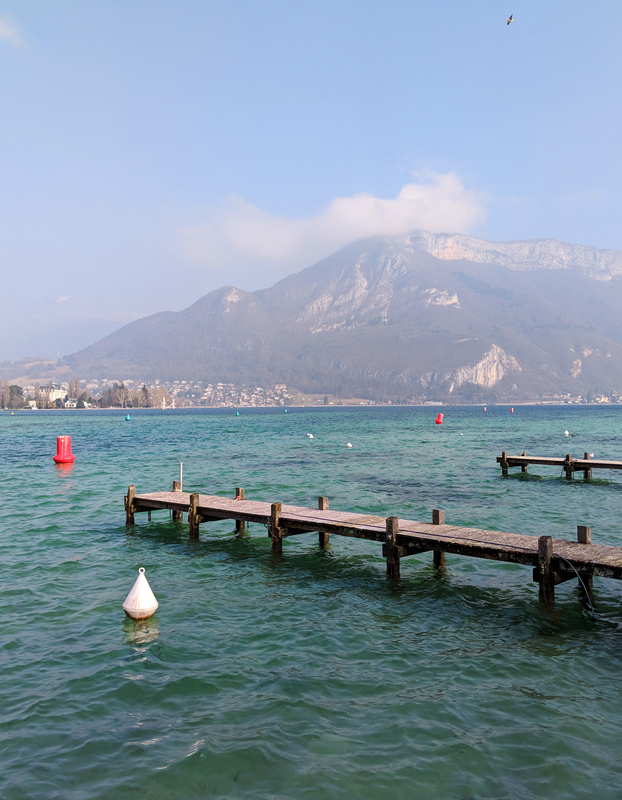 As I mentioned earlier, Geneva is located close to the French border, making it a great hub to explore other picturesque areas nearby – no less than Annecy, a pretty French town just a 50 minute bus ride from Geneva. It’s known for its Old Town too, with cobbled streets, winding canals and pastel-coloured houses. I challenge you to find a prettier looking town. If you visit on Saturday, it’s also home to a great market, selling all sorts of antique furniture, homewares and clothing. Also, overlooking the city is the medieval Château d’Annecy, once home to the Counts of Geneva. Worth a visit for just 5 Euros if you have the time. 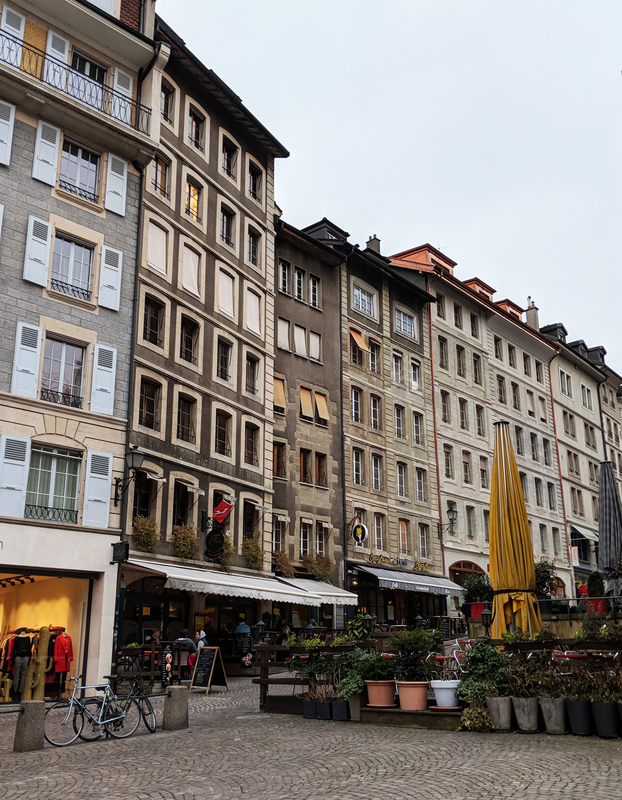 We caught the Flixibus from Geneva to Annecy, for around 60 Swiss Frances for 2 return tickets – pretty pricey, but as is everything in Geneva. I don’t know wether the buses run less regularly in winter months, but it meant that we only had a few hours in Annecy. 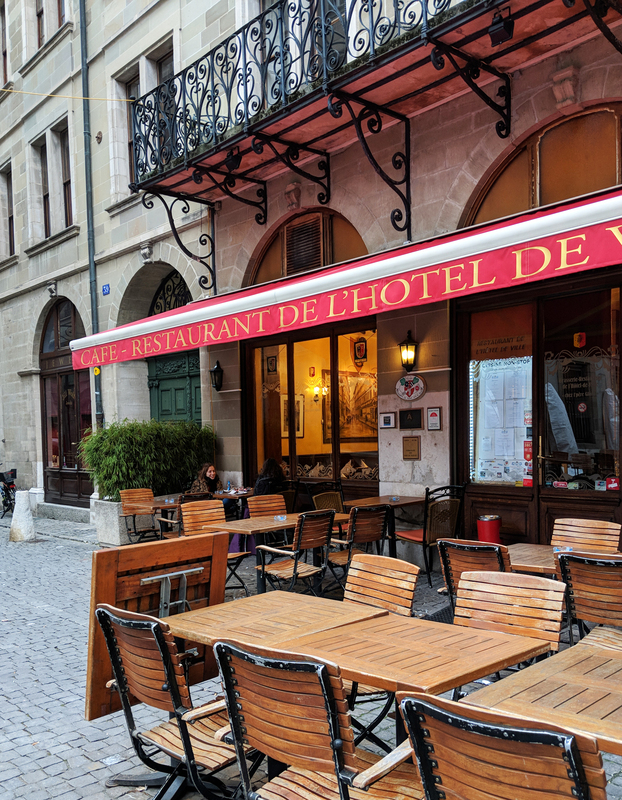 This was enough time to explore the main sights, however it would be great to stay overnight and really soak up the atmosphere of this beautiful French town in more detail. 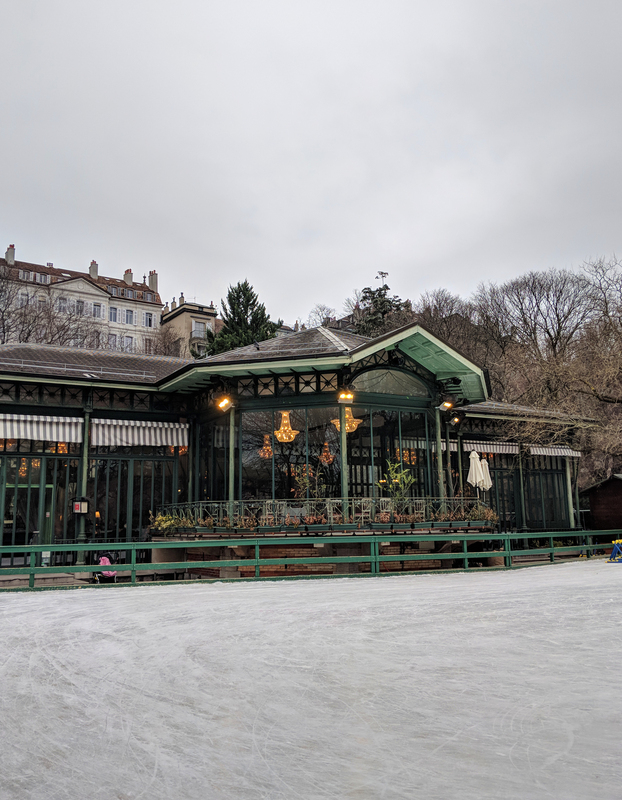 Ice-skating is a big deal in Geneva, with many indoor and outdoor ice-rinks, including this very festive, pretty one, just the other side of the Old Town. Ice-skating is a great activity to do here, not least because it’s super cheap. At most rinks you only have to pay a couple of Swiss Francs for the hire of the skates, otherwise they’re free. 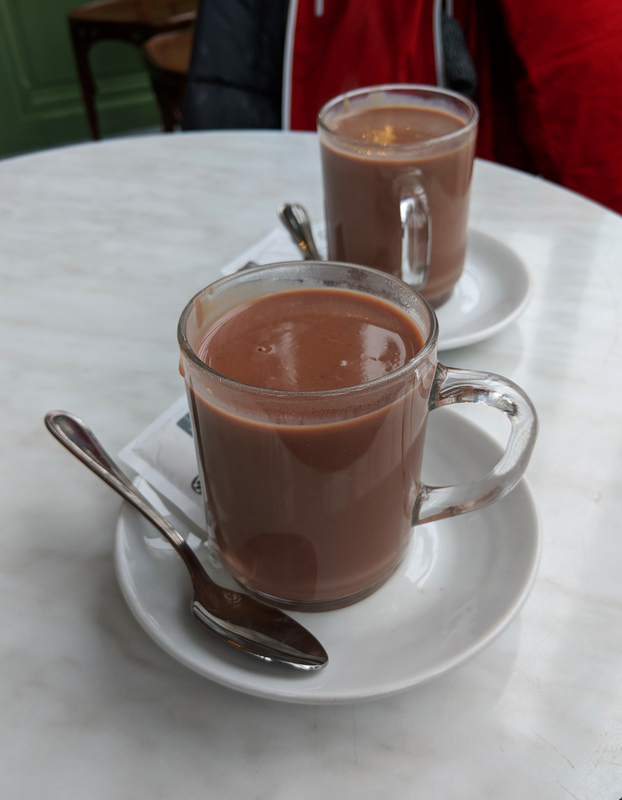 And after skating, you can warm up with a Chocolat Chaud, or hot chocolate as we like to call them (it sounds far better in French). 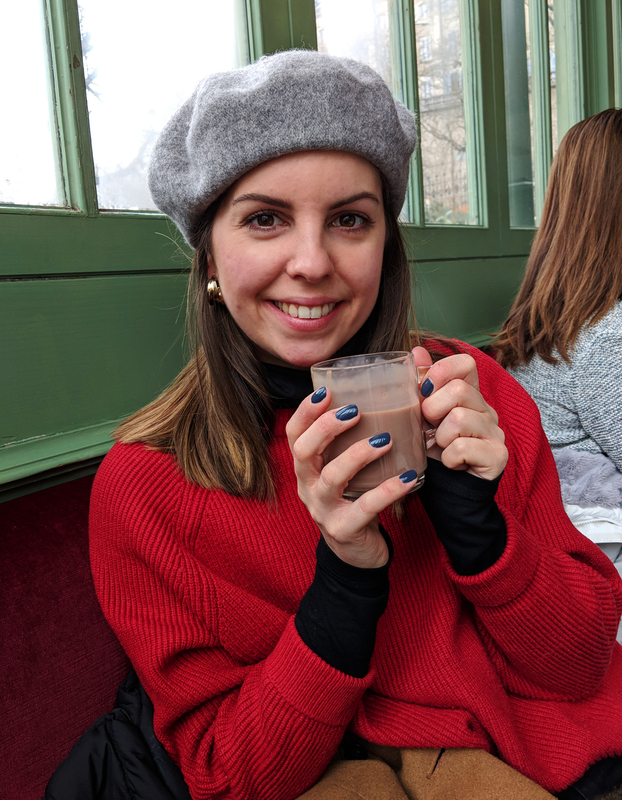 And in Switzerland, it’s not just any run of the mill hot chocolate, they’re made with Swiss chocolate and are incredibly rich and indulgent. It’s a must to warm up on a winter’s day. And finally after all that cold talk, I thought I’d share with you just HOW cold it was when we visited. No need for the sign, I don’t think anyone will be swimming today! Have you ever flown or holidayed with Jet2.com? Have you visited Geneva before?